Professor Clark humoring the paparazzi in the Julius M. Cruse Rare Book Reading Room. At the Keller Library, we enjoy hosting visiting researchers (of whom we see many in the summers), and we had a glorious couple of weeks in June hosting the esteemed Elizabeth A. Clark in our Special Collections Reading Room. Dr. Clark is the John Carlisle Kilgo Professor of Religion and Professor of History at Duke University. She is credited with making the “male-centered field of ‘patristics’ into a vibrant field of ‘Christianity in Late Antiquity,’ and she continues to support all young scholars in the field while giving particular attention to women and others who have not traditionally been in the majority” (quoted from this wonderful Duke University profile). Professor Clark makes a discovery in the A. Cleveland Coxe journals. 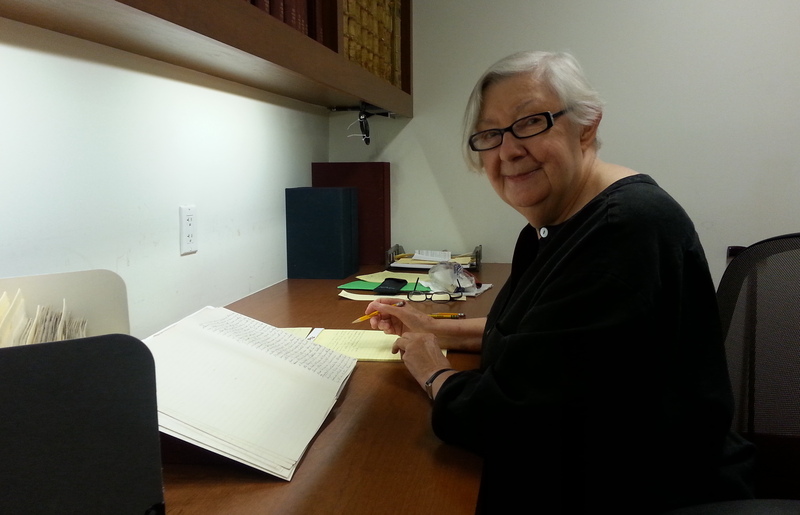 “In May 2014, the Christoph Keller, Jr. Library of the General Theological Seminary received a gift of archival materials from Richard Mammana; these materials had been collected by Cynthia McFarland, archivist of the Episcopal Diocese of New Jersey and given to Mr. Mammana* in 2008. The gift, titled “Bishops’ Papers: Rt. Rev. A. Cleveland Coxe, Bishop of Western New York,” includes five boxes of Coxe’s “Journals,” i.e., records of his daily activities from 1864-1896. Ms. McFarland apparently planned to write a biography of Coxe, but the project never materialized. Arthur Cleveland Coxe graduated from The General Theological Seminary in 1841. As a seminarian, he became a disciple of John Henry Newman, harboring no suspicion that Newman was about to convert. Writing after Newman’s “defection” to Rome in 1845, an enraged Coxe denounced “the Romish system.” Later, as bishop, he publicly declared that he would not ordain to the Episcopal priesthood any candidate with Tractarian sympathies. Of particular interest to me in Coxe’s journals are entries for the years (1884-1887) during which he was preparing his edition of the Ante-Nicene Fathers. Week by week, Coxe records his labors on the Series in the midst of his busy schedule as bishop. He noted which authors he found particularly interesting (e.g., Clement of Alexandria), but frequently complained about the press schedule, the poor work of the printers, and his own inadequacy for the task. Although his journal entries do not reveal the full extent of his campaign against Roman Catholicism, Coxe comments that if Americans can digest the Fathers, American Christianity will be regenerated, “Sectarianism and Popery” destroyed. Your reference librarian adds that it was a thrill to meet Dr. Clark and have her with us, and we look forward to following her work on this topic!